This saying is likely a mistaken rendering of a proverb that says not to peep on both sides of a bamboo joint. " タケフの両ノゾキするべからず " 両ノゾキ means double peep (See diagram). The original text of this page follows. The black structure is a bamboo joint. peeps at it. A peep threatens to cut something, but a bamboo joint cannot be cut with the next move. Thus, peeping at a bamboo joint is a wasted move — but remember: The bamboo joint may be short of liberties. Here, throws itself against a wall. This is worse, because it loses a liberty immediately, but the idea is more or less the same: a bamboo joint is almost as strongly connected. White here is called a trick play in a Korean book. That seems unfair. But the point is that Black might play at a in answer. Then after to , Black would be peeping at both sides of a bamboo joint, which is taboo. One peep may be acceptable, but with stones at and a it can't be that both are efficient. 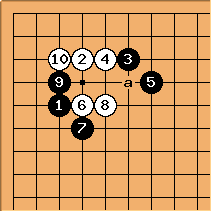 Actually the correct joseki here avoids (postpones) the other peep, too. 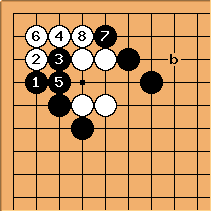 Black should play this way, so that the kikashi is available. This does something to cover Black's weak point at b.